Are You Tough Enough to Manage Your Committee? THAT QUESTION MIGHT sound ridiculous. Committees are not known to strike fear into great leaders. Nor are they known for their speed, decisiveness, or command of real power and resources. And that is precisely the problem in joint ventures. 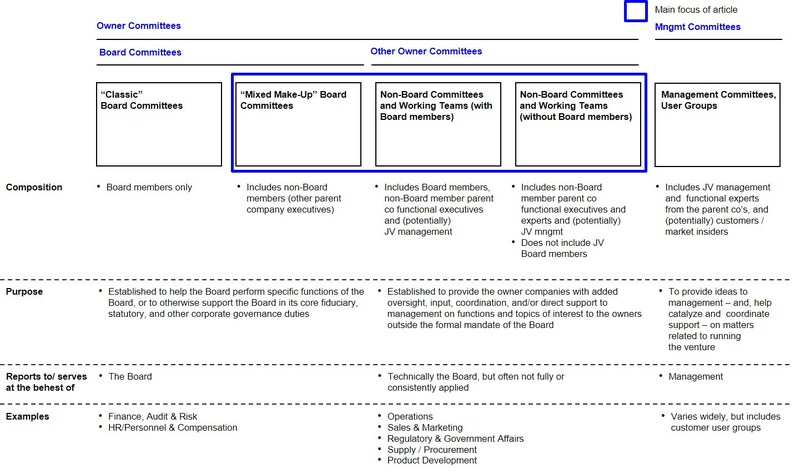 Sketch out the governance and organizational structure of a joint venture, and you’ll often find at least a few – and sometimes far more – Board and other owner committees, sub-committees, and working teams operating in the never-never-world between the Board, the Shareholders, and Joint Venture Management (Exhibit 1). Most are not classic Board committees but, rather, committees charged with performing narrow roles beyond the mandated functions of the Board or mainly comprised of functional experts from the parent companies who do not sit on the Board (Exhibit 2). They are created to provide “input” to venture management, deliver an added level of “assurance and oversight” to different aspects of venture operation and new capital investments, and “advise” the Board on specific matters such as budgeting and planning, product development, vendor selection, manufacturing and operations, marketing and sales, and government affairs. But committees can be a formidable threat to joint ventures. The purpose of this memo is to outline where JV committees go bad. In part two of this article we will show how JV Boards and CEOs must actively manage such groups to ensure they contribute to – rather than undermine – venture performance. To be clear, this memo is not aimed at classic Board committees;1 rather, its focus is on other types of committees that tend to be spawned over time within the broader stream of joint venture governance. The Promise. Committees and working teams have a legitimate role to play in many JVs. They can help deliver expertise to a venture that lacks the scale to hold certain specialist skills in-house. They can alleviate some of the burden of governance – especially in domains where Board members lack the time or expertise to perform adequate oversight on their own. And they can provide a mechanism for operational staff within the shareholders to coordinate with each other,2 or to gain a preemptive “voice” into key venture decisions (e.g., product development, sales strategy) that could have a strategic impact on the shareholders’ businesses and assets held outside the JV. We’re desperately keen to keep functional experts engaged and involved in the JV. Committees are our best way to do this. We see committees as a safeguard against “rogue management” – and, more importantly, as a way for technical experts to agree on basic assumptions about the market, the geology, the technical specifications for contractors, and the integrity of the larger technical plans to exploit the resource.… And to do this before all the political bargaining at the board begins. Committees are certainly not the only way for shareholders and management to fulfill these objectives (Exhibit 3). Secondees, peer reviews, audits, technical and administrative shared service agreements, use of parent company processes and systems, short-term rotations by shareholder engineers and staff – all are alternative means of meeting many of the same goals. Large, capital-intensive natural resource JVs: When natural resource companies like ExxonMobil, Total, or Rio Tinto invest billions of dollars in large jointly-owned assets, they tend to establish function-specific committees from the earliest stages of project development. Initially, committees drive many critical elements of project design and evaluation, including technical and commercial feasibility. Over time, as a project moves into construction and then operations, committees are retained (hopefully with some re-scoping of roles and authority levels), with their purpose switching more to oversight and decision support. Multi-owner JVs providing a core technology platform: Another class of committee-using JVs are entities like Star Alliance (airlines), Next Issue Media (online magazine platform and distribution), and SWIFT (global financial settlements) – that is, ventures with large numbers of owners usually aimed at creating a common technology platform and new products for their owners. 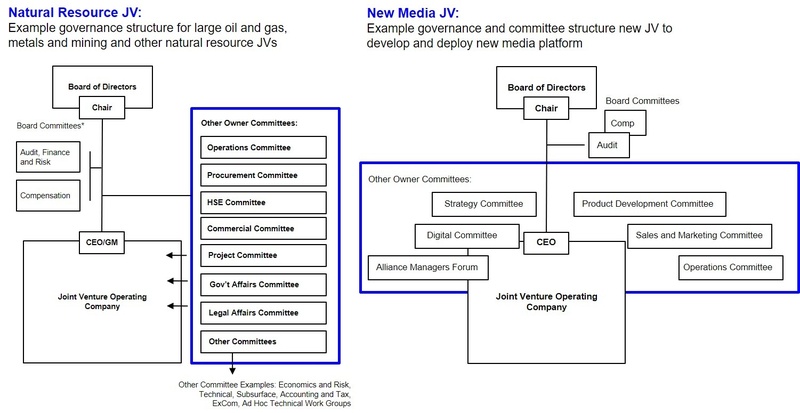 Here, the JVs use committees principally as a means to secure product and market input from operating-level managers within the shareholder companies. Other JVs with significant sales or product-related interdependencies with the shareholders: Finally, there are those bilateral ventures that leverage their shareholders for significant assistance (and work) along the value chain – from product development, to manufacturing, to marketing and sales. JVs in this category include Merck-Schering (pharmaceuticals), work-sharing JVs in aerospace and defense (e.g., CFM), and Nissan-Renault (autos). When committees and working teams are used in such ventures, they tend to be mechanisms to coordinate specific functional workstreams occurring within the shareholders (and venture). The Perils. Unfortunately, many JV committees don’t deliver on their promise – and may even introduce added costs and risks. As JV Board Chairs, Lead Directors, other Board members, and the JV CEO look at their non-Board committees, it is worth testing whether the venture is falling into any of the following five common pitfalls ... Click below to continue reading this article.